Ailie Blunnie: if you were the only buoy in the world . . .
Ailie Blunnie has crisscrossed the country to bring her debut album, West To The Evening Sun, to life. 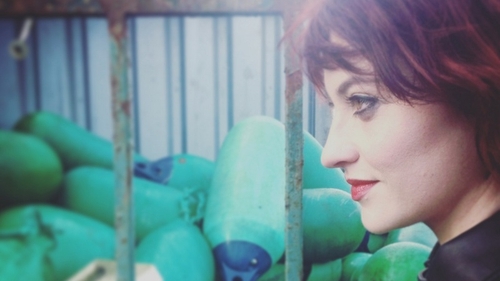 Written in Sligo, Leitrim and Dublin over the space of four years and recorded in Limerick over the course of a year, the recording finds the 32-year-old singer songwriter from Carrick-On-Shannon digging deep, both lyrically and musically. She’s into the art of emotional excavation on songs about lost love, escape and, naturally, a chance romance with a bicycle she stumbles across on a country road. Her music is an atmospheric and experimental mix of what she calls urban Celtic folk pop. It is also quirky, moving, and musically lush but most of all West To The Evening Sun is brimming with beautiful melodies sung in Blunnie’s sensual and bell-clear voice. "I wrote a lot of the album in a little place in north Sligo beside Lissadell House. I rented a little cottage there a few times, just to get away from Dublin," she says. "So I wrote a few songs on location and songs like Row Out to Sea and I Promised Her Gold were written with me imagining myself back in Leitrim or Sligo or Roscommon. I Promised Her Gold was written just outside Derrycarne woods, myself and my mam used to go there sometimes. She was an Irish teacher and we used to practice for the Irish oral exams there." Blunnie’s first forays into music were in her teens when she sang in a pop/rock band called Revamp. She then sang with her older sister Roisin, who is now a choir leader and lecturer in music at DCU, in local bars in Carrick. Ailie then released her own EP in 2013 and two years later she won a prestigious UK song writing contest. It’s no surprise to hear that music runs in her family. Blunnie's abiding childhood memory is of her father, who was also the local church organist, playing the piano while reading the newspaper at the same time. "When you’re growing up you’re mad to get out of the small town you grew up in and you’re really enjoying your freedom and then suddenly your attitude to home changes." "My mother’s side of the family were also very much into trad music," she says. "They sang and a couple of them directed plays and things like that but our generation - my cousins - a lot of them would be in trad bands so there would be a good bit of trad on that side of the family. We would have been brought to all the fleadhs when we were growing up." Blunnie graduated from Maynooth with a degree in music and French and is now "an on and off" English teacher. She is also currently studying psychoanalysis and counselling. She has been living in Dublin for seven years and West To The Evening Sun is a canny mix of town and country; some songs have the stillness of lonely bedsit vigils, while others sound like they were spirited up from the very landscape of her home in North-West Ireland. "If I’m writing songs I tend to put them in situations, even if it’s just the memory of the location," she says. "When I went to write the album I was in my late-twenties and I was rediscovering home. When you’re growing up you’re mad to get out of the small town you grew up in and you’re really enjoying your freedom and then suddenly your attitude to home changes." She sings about "the Yeatsian sea" at one point on the album and several of the songs were written in Yeats country but it turns out she is more inspired by the work of the other Yeats brother, artist Jack B. "The reference to the Yeatsian sea is more that the Jack B Yeats painting," she says. "That song is about letting go of someone you’re close to for your own good rather than out of a want of doing it. But yes, I would have read a lot of poetry and I’m into it but I wouldn’t have set out to base any of the songs on poems." Blunnie spent a year recording West To The Evening Sun in Limerick with fellow musician Daragh Dukes and she sees him more of a collaborator than a producer. "I didn’t really know what a producer was before I met up with him. Daragh does a lot of music for TG4 and RTÉjr, a lot of composing for documentaries," Blunnie says. "I didn’t really know what I was going down to but I wanted an outsider perspective on the songs. I was kind of hiding behind tried and tested things that I knew worked. "I would refer to it more as collaboration. He made suggestions and suggested that I get back into the place where I was when the emotion was at its rawest. It was actually quite emotional because I didn’t know him that well." She describes her album as "98% autobiographical". Songs like Happy New Year strike a resounding emotional chord like Joni Mitchell. "All of that song is true but I wrote it three years on from a break-up but I was too embarrassed to say it because I figured I should be over the guy by then!" However, the album is no angst-ridden confessional. There is plenty of humour and music as rich and layered as this does not misery make. West To The Evening Sun also appears beguilingly simple but repeated listens yield up its treasures. "It was about taking stuff out rather than putting stuff in," she says. "We pared it back. Making an album is very different from doing a gig." Armed with a metronome and a brand new piano pedal, which she has fallen in love with, Blunnie takes to the stage in Whelan’s in Dublin this Sunday night to spread the word but this "on-off" English teacher with a passion for psychology is keen to keep her day job and her art separate. "Part of me wants to keep the music apart from jobs and careers," she says. "But I think the underlying motivation for both careers is the same - it is digging down deep and really getting to the heart of your emotional awareness and then trying to communicate that to someone very simply." She also plays at St Michans Church in Dublin on January 24 as part of Tradfest and has her own headline gig at Whelans this March.